I’m a parent…four times over. Like anyone else, I love seeing my kids enjoy themselves. And I’ve spent a lot of money the past 12 years in an effort to create plenty of fun and lasting memories for each one of them. We’ve done Disney and Sea World – several times. We’ve rented the condo at the beach. We’ve booked the Royal Caribbean cruise. We’ve done the day trips to the Georgia Aquarium, the Atlanta Zoo, and the Coca-Cola museum. All were awesome experiences with great memories. However, they all required major budget planning sessions. The vacations forced us to save for months. Recently my oldest son reminded me in an interesting way, memories don’t have to bust the bank. They can be created with very little money leaving our wallets. 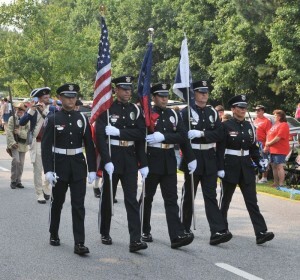 Each summer, a town near us holds a 4th of July parade. It’s what you would expect from a typical small town parade. Fire trucks and police cars, some veterans driving military vehicles and dozens of floats created by local businesses and civic organizations. Oh…and all the candy being thrown from the people on the floats into the crowd. It’s a big tradition for which thousands turn out. People actually stake tarps into the ground the night before to reserve their spot. We do something a little different. Each year I get up before sunrise with our two oldest children. We load up all of our supplies – cooler for drinks, blankets, lawn chairs, pop-up canopy, card games and sunscreen. We drive to the parade route, unload our stuff to mark our space and then head off to Waffle House for breakfast. After breakfast, we head back to the parade route and await the arrival of Mrs. Luke1428, the two youngest kids and the grandparents. We have a great family time all morning sitting around, enjoying the parade – sharing in the spirit of the holiday. The kids love doing this. All it costs me is my time, a little gas and about $15 for the three of us to enjoy waffles for breakfast (with a side order of hash browns – smothered, covered and chunked). Last year though, me missed the parade. We were invited to visit a family farm in northwest Missouri. It’s a long trip to just north of Kansas City, so we decided to make it a week long vacation. On our way to the farm, we spent a few days in St. Louis over July 4th. We did fireworks at the Arch, Grant Farm and the St. Louis Children’s Museum. All three were incredibly fun! As fate would have it, we are going to busy this July 4th as well. We’ve been invited to share a beach house in North Carolina with some family members over those days. Interestingly enough, when we told the kids what we were doing and when it was, I noticed my oldest son slumped his shoulders and got a sad look on his face. “Hey buddy, what’s the matter?” I said. “Don’t you want to go to the beach? It’s gonna be a blast!” His initial response took me aback. b) All my kids really want is me. By “me” I mean my time – fully engaged and focused in their world. It’s easy to whip out the credit card and drop $125 on parking, admission and food for a day trip to the Georgia Aquarium. Or we could drive a few miles east to Stone Mountain where we can pay a parking fee of $10 and enjoy a day of hiking, all topped off by a spectacular laser and fireworks show after dark. There is nothing inherently wrong with either choice. It’s a $115 decision. Just don’t assume your kids will have 10 times better memories because you spent 10 times more money. I don’t think it works that way. What is your favorite, inexpensive family activity? Next Post: Can We Ever Step Off the Gas With Our Finances? Prior Post: How Do You Create Time to Blog? We too have enjoyed our Disney type vacations, but some of our best memories are on camping trips that take the price of gas and food. You can’t beat being out in the woods with no internet or TV to distract you. We love Disney but those days at the park are so long and hectic. So many activities…such long lines. Seems like you spend half your energy just managing the day, which can lead to a lot of stress. You’re welcome Laurie. I know it’s tough especially when your own kids start talking to you about what “all the other kids” are doing or getting. I really believe it all goes back to the fact that our kids just want to be with. They will be perfectly content if we give them our time and attention, even in little activities. If we don’t, they will find something or someone else to feel that attention void…guaranteed. And it may end up being something or someone we don’t like. So true, Brian! Have you read Re-Create, by Ron Luce (avail at Amazon). It talks about this exact same thing and how to avoid it. Great book! Thanks for the suggestion. I’ll have to check that out. Absolutely true. I find that often the most expensive presents have the least positive impact, such as electronics that take away from family time. We really work hard to fight the “electronics war” at our house by limiting the amount of time our kids play on them. You’re 100% right…it can really take away from quality family time if you’re not careful. Very good point. I often have to remind my wife of this and point out that my 3 year old son gets as much enjoyment out of going to a high school football game as he would from going to a NFL or college game, and for pennies on the dollar comparatively. High school football is a blast with much less hassle. At 3 years old, he would probably not retain much of any long-term memory from an NFL game anyway. Wow…you are close enough to the beach to pull them in a wagon to it. That’s awesome! It’s even better that you know so many people there. We love the beach…just don’t get there very often. Only beaches you find in middle Georgia are man-made at a lake somewhere. Not quite the same. You are so right, free things can be so much more fun. I don’t have kids, but I love small town parades. My mother still lives in a small town, so I try and visit her once a year around ANY parade time haha. I have so much fun trying to pick the candy up for all the little kids. It’s so much different than where I live, because everyone says hi and even the kids say excuse me. I took my husband one year around his birthday (thinking he would hate it and I would ruin his birthday), but to my surprise he loved it just as much as I did. I think it goes back to the connection that a small town, intimate setting brings to the table. You feel more a part of it when it’s in your hometown and there is not as many people. This is so true. You don’t have to spend money to create memories. It reminds me of the old tride and true method of gifts for children. You get them a nice big toy and they end up playing with the box. Kids don’t care about the cost, they care about having fun. Same thing goes with pets haha. My cat and dog love playing with things that fall on the floor more than their toys! Our dogs have never been into toys. They would rather chase the cat next door or the squirrels in the yard. We have so many Christmas presents that have gone unused. We have stopped surprising our kids with cool things we think they will like. Instead, we just ask them what they want and see if that fits into our budget. Even then, they don’t always play with it. Why is it always the things you spend little money on that the kids remember the most? We’ve started to see that ourselves even though our oldest is only five right now. I think it shows that kids want our time and while things are fun, it’s the simple things with you they remember the most. It’s a great question John. I’m not sure I know the full answer but I think some of it has to do with our level of engagement with them. For example, when we go to the aquarium, it’s usually hectic. We are fighting crowds, making sure we aren’t losing a child and scurrying from exhibit to exhibit. We are focused on managing the day rather than interacting with the kids. And they are more focused on the attractions than on us. When we are picnicking at Stone Mountain waiting for the nighttime laser show, there is not much to do. We talk, play cards and watch other people on the lawn. Last time we were there, my wife wrestled with the boys in the grass for about 15 minutes. They will never forget that.